The aim of WoRMS is to provide an authoritative and comprehensive list of names of marine organisms, including information on synonymy. While highest priority goes to valid names, other names in use are included so that this register can serve as a guide to interpret taxonomic literature. The content of WoRMS is controlled by taxonomic experts, which are technically supported by the Database Management Team. Aphia, the consolidated database behind WoRMS, contains valid species names, synonyms and vernacular names, and extra information such as literature and biogeographic data. Besides species names, Aphia also contains the higher classification in which each scientific name is linked to its parent taxon. The classification used is a ‘compromise’ between established systems and recent changes. Its aim is to aid data management, rather than suggest any taxonomic or phylogenetic opinion on species relationships. 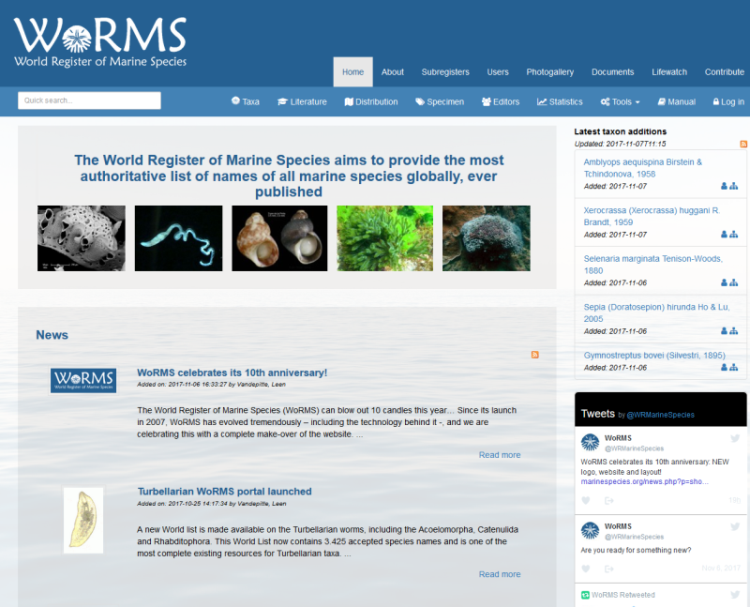 The MarineSpecies.org website and Aphia database are developed and hosted by the Flanders Marine Institute (VLIZ). Resources to build MarineSpecies.org and Aphia were provided mainly by the EU Network of Excellence 'Marine Biodiversity and Ecosystem Functioning' (MarBEF), and also by the EU funded Species 2000 Europe, ERMS projects and LifeWatch Belgium (WorMS being part of the LifeWatch Taxonomic Backbone). As a user or developer you can use the WoRMS web services to feed your own application with standard WoRMS taxonomy. WoRMS grew out of the European Register of Marine Species (ERMS), and its combination with several other species registers maintained at the Flanders Marine Institute (VLIZ). Rather than building separate registers for all projects, and to make sure taxonomy used in these different projects is consistent, VLIZ developed a consolidated database called ‘Aphia’. A list of marine species registers included in Aphia is available here. MarineSpecies.org is the web interface for this database.